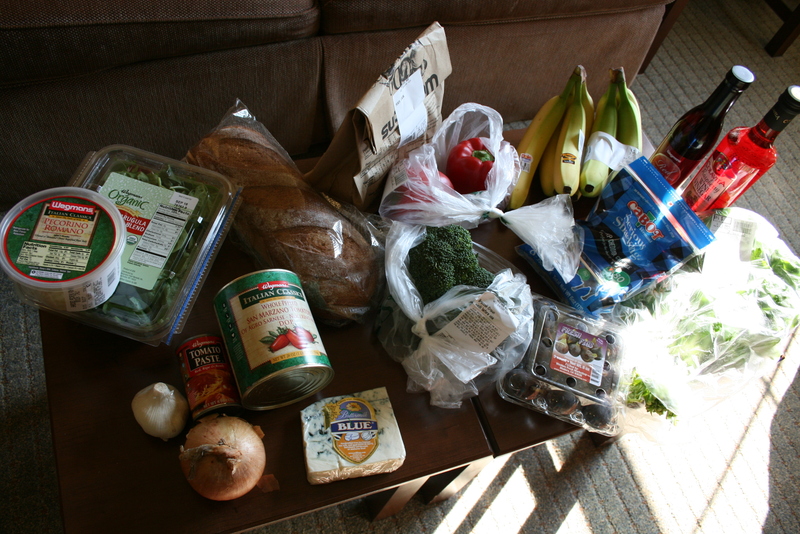 Had to pick up some items yesterday after my meeting with one of the dietetics professors at Buffalo State. I wanted to meet with someone there to make sure I’m on the right track with the classes I’m taking at ECC, and just get an overall “warm fuzzy.” Mission accomplished, and in record time! I fed the parking meter five quarters (1 hour, 15 minutes), but only needed two of them! Oh well, instead of looking at it as a wasted 75 cents, I hoped it would bless the person who took the spot after me. Goodies! I was making Ina’s “Weeknight Bolognese” from her “How Easy is That?” cookbook; it’s a huge favorite of ours. I needed a few things for the recipe and few staples we were running low on. We’ve gone organic! Well, at least mostly. I’m really making an effort to buy more organic and/or local food. I love that Wegmans stocks local produce and highlights the farms from where it comes. 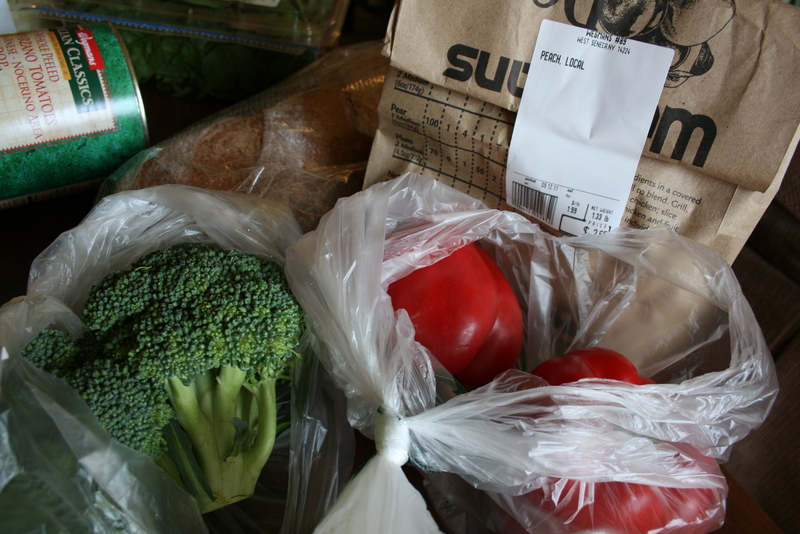 The key to buying organic is getting the biggest bang for your buck. For example, I eat a TON of spinach and yogurt, so those are things I should make sure are organic. But the random can of tomato paste or the gallon of milk Andrew and I won’t get through before it goes bad? Those would be a waste of money. Also, think about WHAT you’re eating. Does it have a thick, outer skin you peel like a banana or an orange? If so, skip organic. Most of the pesticides stay on the skin and since you peel it off, it’s no biggie. 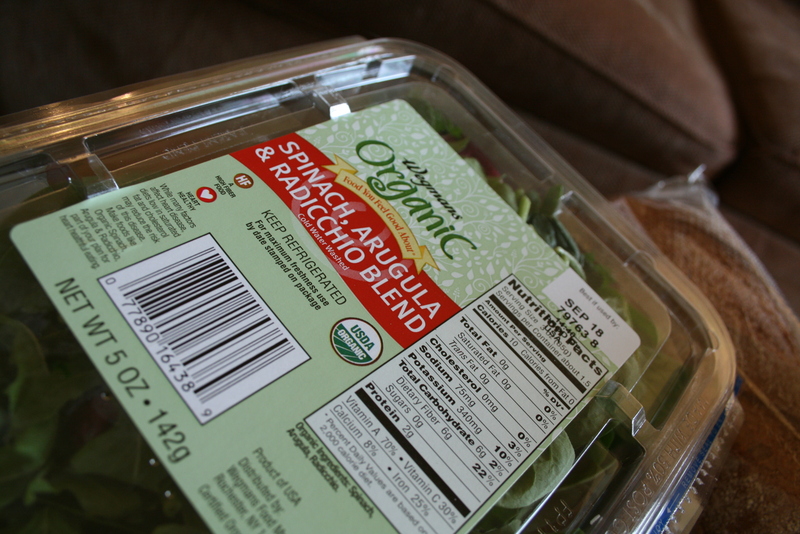 Strawberries and spinach–you eat the entire thing, so it’s wise to get organic in that case. One more thing: get informed about WHERE your food comes from. Different kinds of produce often have different amounts/types of bad stuff sprayed on them or in the soil, depending upon where they’re coming from. Local broccoli (does it not look amazing?! ), red bell peppers and peaches. I bought the broccoli and peaches from the same farms (at Wegmans) last week and was SO IMPRESSED with both of them. 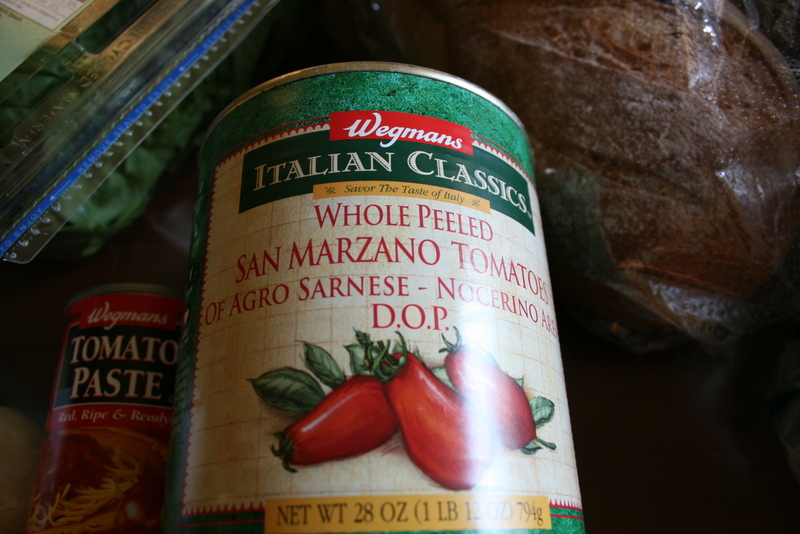 I sprang for the “San Marzano” tomatoes for Ina’s recipe. A lot of the tomato recipes I have call for “San Marzano” tomatoes and I’ve always wanted to try them, but never wanted to pay more. I was in a mood yesterday and just went for it! I did end up with the Wegmans brand, cheaper by 30 cents, but at $3.69 for ONE 28-ounce can, it was still an arm and a leg. The deal with the tomatoes is that they’re grown in a special part of Italy (near the water I think) and allowed to ripen for longer than all the other tomatoes, so they’re deeper, and darker in color and richer in nutrients and flavor. (See Andrew? I bet you didn’t think I knew all that stuff about them.) The verdict: While I’m sure they are a little better, I probably won’t choose to spend extra dollars on canned tomatoes–I’d rather spend it on local/organic food! Also pictured: 100% whole wheat Italian bread from Wegmans’ bakery. I knew Andrew wouldn’t be pleased, but this girl likes whole grains! We had it toasted and rubbed with garlic for dinner last night and I intend to make french toast with some of it this week, too. 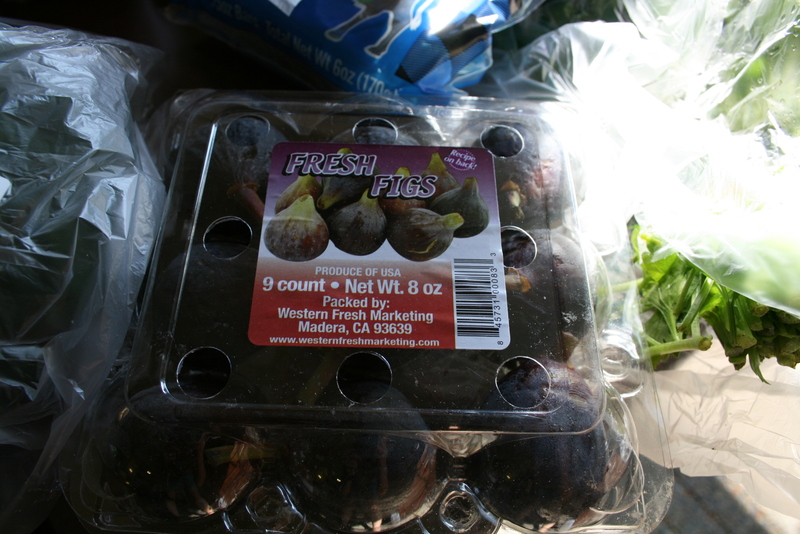 You can’t have figs without blue cheese! 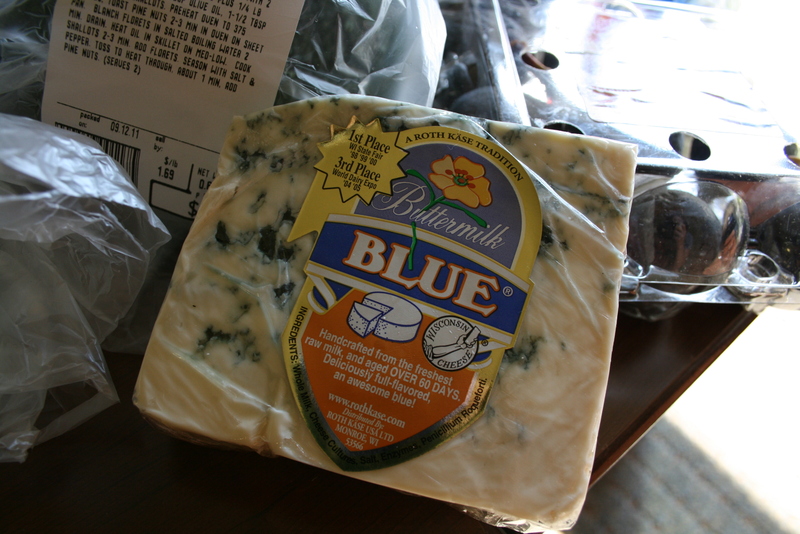 Seriously, even if you HATE blue cheese, you must try them together with some honey–AMAZING! Thankfully, this little package of the mild variety was also the cheapest. I keep cheese sticks around 24/7 for snacks. I love to pair one with an apple for between classes at school or after the gym. I usually buy mozzarella cheese sticks, but this time I wanted to get organic ones. Again, I eat A LOT of cheese sticks, so it would be worth it to buy organic. However, I couldn’t find any (which surprised me, maybe I was looking in the wrong place? 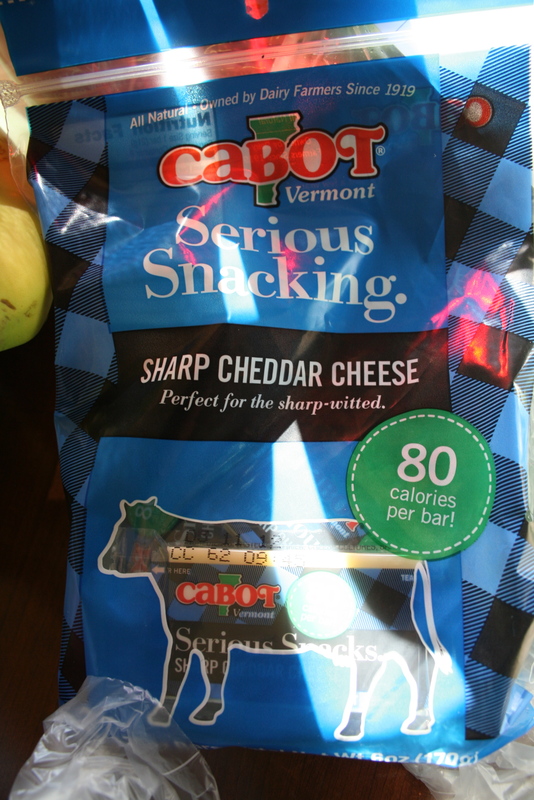 ), so I ended up with Cabot brand sharp cheddar sticks. They were actually a bit cheaper (although the package was smaller, 8 vs. 12) and I thought it would be nice to change it up a little. I really like Cabot brand–it’s a co-op (!) owned by dairy farmers and all natural. Not to mention they’ve won tons of food awards for their cheeses… I bought their regular yellow cheddar last week in the sliced version for sandwiches. No processed cheese “food” for this girl! 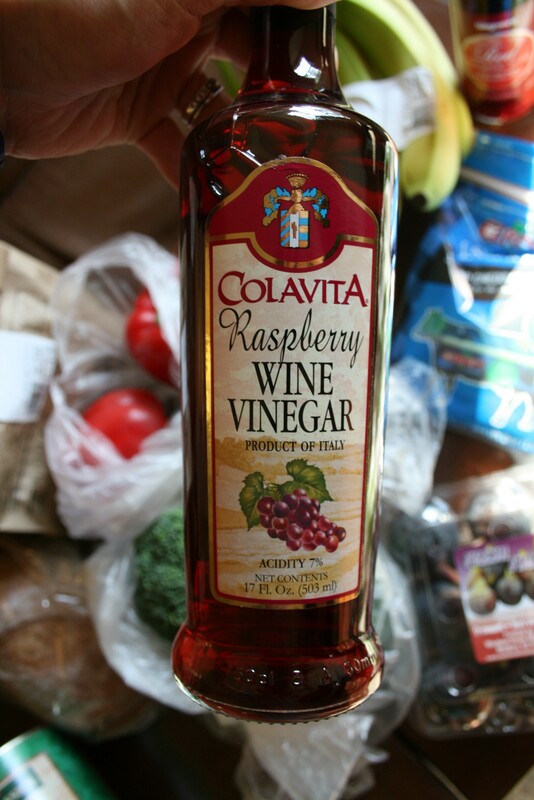 Raspberry Vinegar!!! I found it! I have been looking for this forever… I have an awesome wild rice recipe from one of Ina’s books and it called for this kind of vinegar and I can never find it. FINALLY. Now, if we could only buy a house, wait two months to close, move in, and unpack my cookbooks…I could make it. Posted on September 13, 2011 February 27, 2016 by thehealthypineapplePosted in #fabfoodTagged cheese, Co-op, cookbooks, Food, local/organic, strawberries, yogurt.